The Indochinese tiger is a subspecies of tiger given the scientific name (Panthera tigris corbetti). It is a nocturnal carnivore and one of the largest predators in the jungle. Not much is known about this creature because of its where-abouts. They live in remote areas and are hard to track down, much less track. Furthermore, the governments of the countries they are found in do not let researchers come in to study the habitats or the environments they occupy. Their life span is usually from 15 to 26 years. The Indochinese Tiger is one of many tigers that is going extinct. For females' average length is usually 7'7" - 8'8" long and they weigh under 300 pounds. The male tigers are usually 8'5"-9'4" in length(not including the tail) and they can weigh up to 370-430 pounds. This tiger's tail will grow up to be 3 to 4 feet long. For extra balance and proportion these tigers use their tails. This is a trait that also comes in handy when they charge along sharp turns at a high speed. 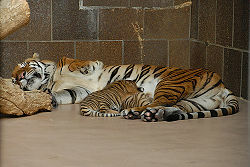 The male Indochinese tiger is bigger than the female. The males also have more whiskers. They have orange coats with skinny, black, vertical stripes lining their back, legs, and sides. They have white fur on their stomachs, throat, and parts of their face. Instead of having thin stripes, they break up into rows of spots where the strip may have been. The tigers average to have more than 100 stripes on their coats. Indochinese tiger cubs nursing. Henry Doorly Zoo. Omaha, Nebraska. USA. Towards the end of November into early April is mating season for these tigers. The average length of time for a pregnancy (gestation period) is 103 days. For these tigers, floods, fires, and infanticide are the main causes of infant mortality. During the first the tigers mortality can be up to 35%, but sadly the mothers litter dies the other 73% of the time. The Indochinese tiger can give birth to up to 7 cubs, but they usually have about 3. After about 8 months the baby tigers join their mothers in hunting. At 6 months they can hunt on their own, and not rely on their mother for support. These baby tigers will grow to be 18 to 28 months old when they attempt to leave their mothers. Since researchers are not allowed into the countries where the Indochinese tigers maintain their habitats their infant mortality in the wild is unknown. But while in captivity in zoos' and man made habitats doctors and researchers have observed that the female tigers have produced through the age of 14. Which is amazing considering they usually live from ages 15 to 26. It is estimated that there are only a few hundred of the tigers presently alive and living in the wild today. About 60 more Indochinese tigers are living in zoos spread out all over the United States and Asia. A big problem for these beautiful animals is the locals hunting season, and poaching. These animals with their stunning coats are worth a lot of money in black markets. They are commonly smuggled across the boarder and sold for a lot of money. Another reason for their being close to extinction is the fact that they are being forced out of their natural habitat. Villagers are advancing into the jungles and making more and more houses. By doing this the tigers are running out of room to roam freely. There are risks for protection among the people because of the tigers having no where else to go. The Indochinese tiger can be found in the following countries: Malaysia, Thailand, Myanmar, Southern China, Laos, Vietnam, and Cambodia. They live in the remote forests' of these countries usually in mountainous or a hilly terrain. These tigers eating diets are mainly on other large animals. Some of the animals that they prey on are: Pigs, elephants, cattle, wild dogs, deer, antelope, hogs, and many other warm or cold blooded creatures . 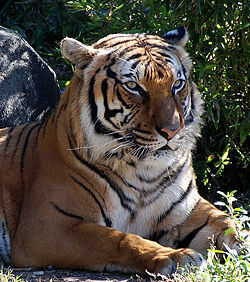 Indochinese tigers that live in the wild can eat up to around 40 pounds of meat. When tigers consume that much food they take a few days and sleep or lay around and do not eat for a couple of days, due to digesting such a huge portion of food. 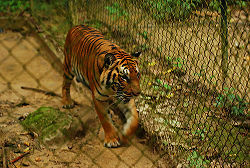 The Indochinese tigers that are caged up in zoos do not eat as much as the tigers in the wild. When in captivity they are fed smaller portions. These tigers can eat as much as 10 pounds a day mainly made up of vitamins and horse meat. Indochinese tiger. Henry Doorly Zoo. Omaha, Nebraska. USA. Indochinese tiger cubs. Henry Doorly Zoo. Omaha, Nebraska. USA. TIGER Panthera tigrisEnchanted Learning® 1997-8. 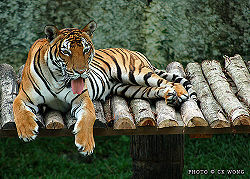 Indian Tiger » Tigers Around the Globe » Indo-Chinese Tiger Indian Tiger Welfare Society, 2005. Indo-Chinese Tiger Forced into scattered, small refuges World Wildlife Fund, 2008. Information Regarding the Indochinese Tiger Omer Ashraf, 2008. This page was last modified on 27 February 2014, at 20:15.